Sarah Palin: We Must Restore America and Restore Honor. 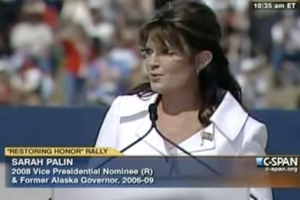 Here is a three-part series of videos of Governor Palin’s speech at the Restoring Honor Rally that was posted on YouTube by NewsForAmericans. There is also a video and transcript of her speech on C-Span that can be found here. I hope that Dr. King would be so proud of us, as his niece Dr. Alveda King is very proud as a participant in this rally,” Palin says. “This is sacred ground where we feel his spirit and can appreciate all of his efforts. He who so believed in equality and may we live up to his challenge. I believe Dr. King would indeed be proud of what took place on the steps of the Lincoln Memorial today, in spite of what Al Sharpton had to say. It is quite a shame, albeit not a surprise, that Sharpton would use his rally, not far from the Lincoln Memorial, to bash the efforts of Glenn Beck, Governor Palin, and Dr. King’s own niece, Dr. Alveda King, among others. Unlike Sharpton’s tactics, those involved in the Restoring Honor Rally were all about unity, hope, and faith in God. Not even the usual hot air from Al Sharpton was able to quench the fire and excitement of those present and those watching from home. And of course, those at the Lincoln Memorial were not spewing any hatred toward the Dr. King rally taking place nearby, but they did have plenty of good things to say about Dr. King, his dream, our nation, and our troops. What an honor it was to speak today at the “Restoring Honor” Rally in D.C. The following is the text of my remarks. You can click here or here to watch a video of it. Thank you so much. Are you not so proud to be an American? Now, in honoring these giants, who were linked by a solid rock foundation of faith in the one true God of justice, we must not forget the ordinary men and women on whose shoulders they stood. The ordinary called for extraordinary bravery. I am speaking, of course, of America’s finest – our men and women of uniform, a force for good in this country, and that is nothing to apologize for. Abraham Lincoln once spoke of the “The mystic chords of memory, stretching from every battle-field, and patriot grave, to every living heart and hearthstone, all over this broad land.” For over 200 years, those mystic chords have bound us in gratitude to those who are willingly to sacrifice, to restrain evil, to protect God-given liberty, to sacrifice all in defense of our country. They fought for its freedom at Bunker Hill, they fought for its survival at Gettysburg, and for the ideals on which it stands – liberty and justice for all – on a thousand battlefields far from home. It is so humbling to get to be here with you today, patriots – you who are motivated and engaged and concerned, knowing to never retreat. I must assume that you too know that we must not fundamentally transform America as some would want. We must restore America and restore her honor! Now, I’ve been asked to speak today, not as a politician. No, as something more – something much more. I’ve been asked to speak as the mother of a soldier, and I am proud of that distinction. You know, say what you want to say about me, but I raised a combat vet, and you can’t take that away from me. I’m proud of that distinction, but it is not one that I had imagined because no woman gives birth thinking that she will hand over her child to her country, but that’s what mothers have done from ancient days. In cities and towns across our country, you’ll find monuments to brave Americans wearing the uniforms of wars from long ago, and look down at their inscriptions, you’ll see that they were so often dedicated by mothers. In distant lands across the globe, you’ll find silent fields of white markers with the names of Americans who never came home, but who showed their dedication to their country by where they died. We honor those who served something greater than self and made the ultimate sacrifice, as well as those who served and did come home forever changed by the battlefield. Though this rally is about “restoring honor,” for these men and women honor was never lost! If you look for the virtues that have sustained our country, you will find them in those who wear the uniform, who take the oath, who pay the price for our freedom. And I’d like to tell you three stories of such Americans – three patriots – who stand with us today. The first is a man named Marcus Luttrell. His story is one of raw courage in the face of overwhelming odds. It’s also a story of America’s enduring quest for justice. Remember, we went to Afghanistan seeking justice for those who were killed without mercy by evil men on September 11th. And one fateful day in Afghanistan on a mountain ridge, Marcus and three of his fellow Navy SEALs confronted the issue of justice and mercy in a decision that would forever change their lives. They were on a mission to hunt down a high-level Taliban leader, but they were faced with a terrible dilemma when some men herding goats stumbled upon their position, and they couldn’t tell if these men were friend or foe. So the question was what to do with them? Should they kill them or should they let them go and perhaps risk compromising their mission? They took a vote. They chose mercy over self-preservation. They set their prisoners free. The vote said it was the humane thing to do. It was the American thing to do. But it sealed their fate because within hours, over a hundred Taliban forces arrived on the scene. They battled the four Navy SEALs throughout the surrounding hills. A rescue helicopter came, but it was shot down. By the time the sun set on June 28, 2005, it was one of the bloodiest days for American forces in Afghanistan. 19 brave, honorable men were lost that day. Marcus was the sole survivor. Alone, stranded, badly wounded, he limped and crawled for miles along that mountain side. What happened next is a testament to the words: “Blessed are the merciful, for they shall be shown mercy.” Marcus and his team showed mercy in letting their prisoners free. And later he was shown mercy by Afghan villagers who honored an ancient custom of providing hospitality to any stranger who would ask for it. They took him in. They cared for him, efused to hand him over to the Taliban. They got him back safely to our forces. Marcus’ story teaches us that even on the worst battlefield against the most brutal enemy, we adhere to our principles. This American love of justice and mercy is what makes us a force for good in this world. Marcus is a testament to that. Please join me in honoring retired U.S. Navy SEAL Petty Officer Marcus Luttrell. From the time he first heard men marching to a cadence call, Eddie Wright had one dream in life, and that was to be a United States Marine. And as a Marine serving in Iraq, his company was ambushed in Fallujah. He was knocked out when a rocket propelled grenade hit his Humvee. When he came to, he saw that both his hands were gone and his leg was badly wounded. He couldn’t fire his weapon, he could barely move, and he was bleeding to death. But he had the strength of mind to lead the men under his command, and that is exactly what he did. He kept them calm, he showed them how to stop the bleeding in his leg, he told them where to return fire, he had them call for support, and he got them out of there alive. So, please join me in honoring retired Marine Sergeant James “Eddie” Wright. Tom Kirk was an Air Force squadron commander and a combat pilot who had flown over 150 missions in Korea and Vietnam. One day on a routine mission over Hanoi, his plane was shot down. He spent the next five and a half years in that living hell known as the Hanoi Hilton. After two years of solitary confinement, pacing back and forth in his cell — three and a half steps across, three and a half steps deep – Tom was finally moved to a larger holding cell with 45 other Americans prisoners, among them was a man named John McCain. In circumstances that defy description, this band of brothers kept each other alive, and one by one, they came home. Tom was released on March 14, 1973. You might think that a man who had suffered so much for his country would be bitter and broken by it. But Tom’s heart was only filled with love – love for America – that special love of country that we call patriotism. Friends, please join me in honoring retired Air Force Colonel Tom Kirk. My fellow Americans, each one of these men here today faced terrible sufferings, overwhelming set-backs, and impossible odds. And they endured! And their stories are America’s story. We will always come through. We will never give up, and we shall endure because we live by that moral strength that we call grace. Because though we’ve often skirted a precipice, a providential hand has always guided us to a better future. God bless you! And God bless America! Palin dedicated her speech to the troops, honored several American soldiers, and thanked the greatest Americans, both large and small in legacy, for their contributions. If the speech does not show up here, you can watch it here. Take any year and if it divides evenly by four, what you have is an American presidential election year. Add or subtract two years, and what you have is a mid-term election year such as 2010, something not quite as delicious as a presidential year, granted. But I love this year just the same. That’s because I love the smell of napalm in the morning. Smells like victory. And who is shaping up as the leader of the victory this time, who has been throwing the napalm? This is where the year does indeed start to get delicious. Sarah Palin has turned into the king-maker of the mid-term elections. 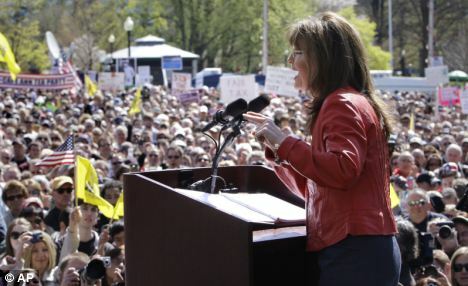 The party primaries have started, and the power that Mrs Palin now has with the anti-government Tea Party movement has started knocking establishment Republicans right off the party ticket. And in the midst of what is being called the Great Recession, as unemployment stays high, house prices get ready to plunge again, and the deficit moves into unimaginable trillions, this Tea Party surge is angry. Some of the Tea Party people might have believed Barack Obama would deliver change for the good in America. They don’t believe it anymore. As Sarah Palin mocked in her speech to the Tea Party Convention in February, ‘How’s that hopey, changey stuff working out for ya?’ Short answer: it’s not. So here is an example of what is happening. There could be no Republican politician more establishment than John McCain, the rich Arizona senator who ran as Republican presidential candidate in 2008 against Barack Obama. Mrs Palin was his vice-presidential running mate. She joined the ticket as an unknown Alaskan governor and turned into a star overnight: a populist conservative, Christian, straight-shooter in every sense. Anyone familiar with John McCain’s career in the Senate – his best political buddy for years was the unspeakably left-wing Ted Kennedy – knew he couldn’t possibly want Governor Palin on his ticket. But the party knew he had to try to get the conservatives onboard. So they ran together, and while Mrs Palin fought for her party, her running mate undermined her. The Democrats mocked her. Their intellectual friends in the mainstream media wrote her off. And they all drove over her broken body together on the way to the inauguration – no, the coronation – of President Obama. Well, Christians don’t believe in the resurrection of the dead for nothing. In the months following the defeat, Mrs Palin started travelling the country, speaking at conservative rallies in dozens of states. They loved her. She showed that she and her support among conservative Americans were back from the dead. Which is why, two years after Senator McCain treated Mrs Palin with such distain, things are so splendidly different now. The surge in the anti-establishment Tea Party movement – or call it the conservative grassroots movement, call it whatever you like – is being felt especially in states such as Arizona, which is plagued by one of the great national problems conservatives want to fight: illegal immigration. Arizona shares a border with Mexico. That means its number one problem at the moment is illegals, thousands upon thousands of them, taking jobs from Americans and from those aliens who are in the country legally, and undermining pay rates and bloating welfare costs. The Obama government will give Arizona no help in enforcing the Federal laws against such illegal immigration (Latinos vote Democrat). The people of Arizona want a serious fence built all along the Mexican border. And until recently, the people of Arizona have been getting no support in this fight from their own US Senator, John McCain. Which is why the Arizona primary election for the Republican nomination for Senator this year looked like a perfect opportunity for the Tea Party and its spiritual leader Mrs Palin. They had a chance to back a strong conservative candidate to take on and oust the establishment candidate, John McCain. And why not? Mrs Palin owed the Senator no favours. Result? On Tuesday, despite distrust among Arizona conservatives, Senator McCain beat a former US Congressman who billed himself as ‘consistently conservative.’ In great part thanks to the power of Palin. 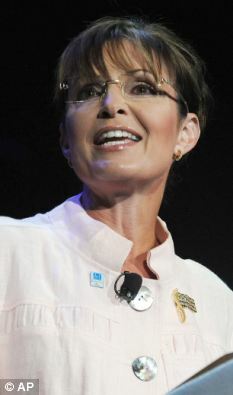 The power has been seen in the other primaries, too, most spectacularly in Mrs Palin’s home state of Alaska. There the establishment-Republican pro-abortion Senator Lisa Murkowski may lose her place on the Republican ticket in November because of a challenge by a Tea Party-Palin backed outsider, Joe Miller. Miller is a Chuck Norris war-hero look-alike (and apparently think-alike). With Palin’s backing, he destroyed a 30 per cent lead in the opinion polls Senator Murkowski held going into this election. How insider is Senator Murkowski? She wasn’t elected to her first term in the Senate, she was appointed in 2002 by the Governor of Alaska when the seat became vacant. The name of the governor at that time was Murkowski. He was her father. Why was the seat vacant? Because Daddy Murkowski had vacated it when he was elected governor. Four other Palin-endorsed candidates won on Tuesday. But Palin has already been claiming victory for the Tea Party for months. She says it was the grassroots conservatives who put a truck-driving Republican into Teddy Kennedy’s Massachusetts Senate seat earlier this year. In May, Rand Paul, son of the much-loved libertarian conservative leader Congressman from Texas, Ron Paul, won the Kentucky Republican primary to face a Democrat opponent in the race for a US Senate seat in November. Of course, all this is just a warm up for what the Tea Party people will do to the Democrat candidates in the November elections for the entire House of Representatives and one-third of the Senate.